Hey everyone! We’re in the middle of summer here in Japan, and temperatures in my little corner are reaching 37C/98F during the day, and sometimes higher! 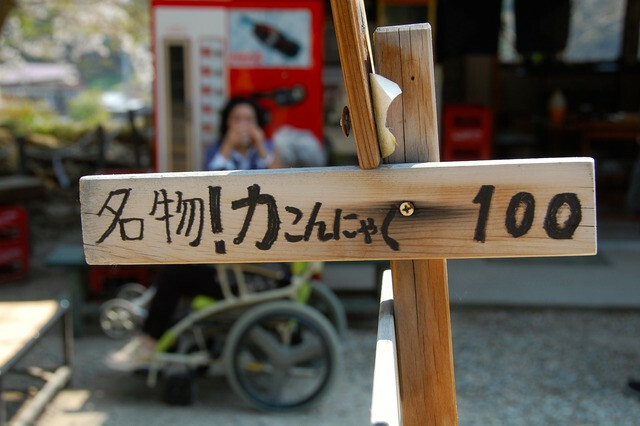 It is HOT! 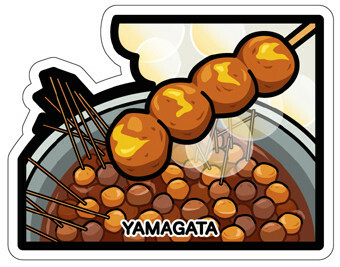 Today, I’m looking north a little to a popular food in Yamagata Prefecture called “tama konnyaku”. 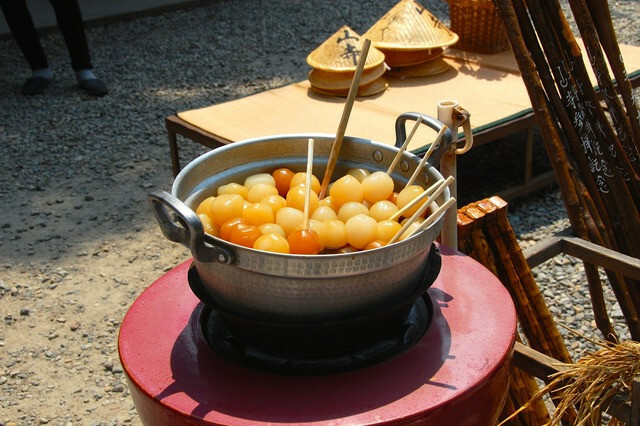 Actually, Gunma is famous for konnyaku too, but not the ball-shaped variety. This kind is shaped into balls and boiled in soy sauce and sugar. 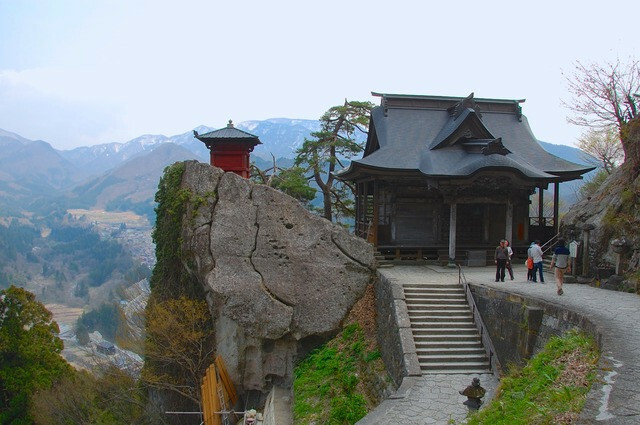 They can be found all around the prefecture, but at Yamadera Temple they are called “chikara konnyaku”, or “power konnyaku”, supposedly giving you enough energy to climb the many stairs up to Yamadera! I find this ironic, as konnyaku has hardly any calories at all. They weren’t bad tasting, actually! And just for fun, a shot of Yamadera. I guess I made it up, so the power konnyaku really works! …maybe. If you can find konnyaku (also called konjac and similar) at a grocery store, you can try making them using this recipe (and feel free to leave off the squid). 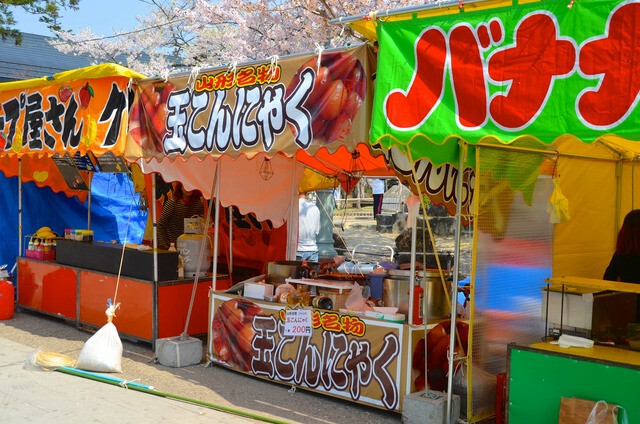 Otherwise, hopefully you can visit Yamagata to try these yourself. Happy eating, and stay cool! Postcard, pot, and konnyaku, yum! 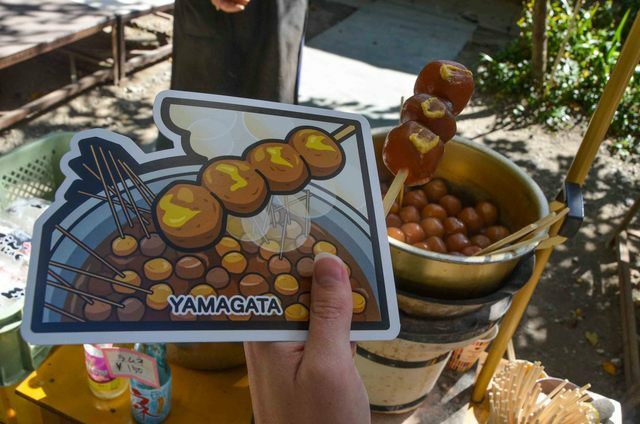 Postacollect Gotochi postcards usually depict famous goods, foods, or places, but of the 282 current cards, 10 feature famous people from the prefectures (11 if you count the folklore legend Momotaro from Okayama). My next posts will introduce two of these: Niigata’s Uesugi Kenshin (1530-1578) and Yamanashi’s Takeda Shingen (1521-1573). These two were both daimyo (warlords) in the Sengoku (warring states) era of Japanese history, and their long-standing rivalry and respect for one another is famous even (especially!) today. Since I’m speaking about their rivalry however, they will both feature in each others’ post, so be sure to read both! 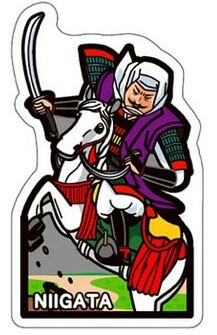 Uesugi Kenshin was the daimyo of Echigo province, and Takeda Shingen the daimyo of Kai Province, which are now the modern-day prefectures of Niigata and Yamanashi. 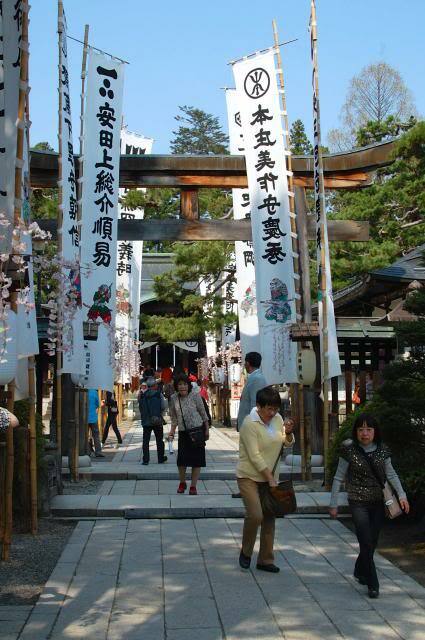 Their rivalry lasted for 14 years until Takeda’s death in 1573, and they engaged in many battles over the years. However despite their rivalry on the battlefield, they seemed to have held a great deal of respect for each other. It is said that Takeda sent Uesugi many gifts over the years, including a very valuable sword, while Uesugi refused to attack Takeda during a vulnerable time while he was being sieged, and even sent him precious salt, saying “wars are to be won with swords and spears, not with rice and salt”. Uesugi’s honorable conduct towards Takeda, despite their multiple meetings on the battlefield, shows his true “samurai spirit”, and the same can be said of Takeda. Their rivalry and lives catch the imaginations people today, as evidenced by the large number of samurai movies, games, and goods that are produced for public consumption, and there are many places around Japan to learn about the history of these two figures. You can read about and explore some of these places here. 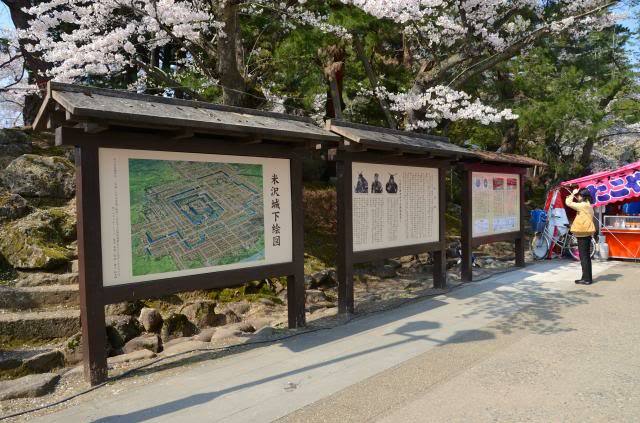 These boards on the way to the shrine have information on Uesugi, Takeda, and some of the other figures of the time. 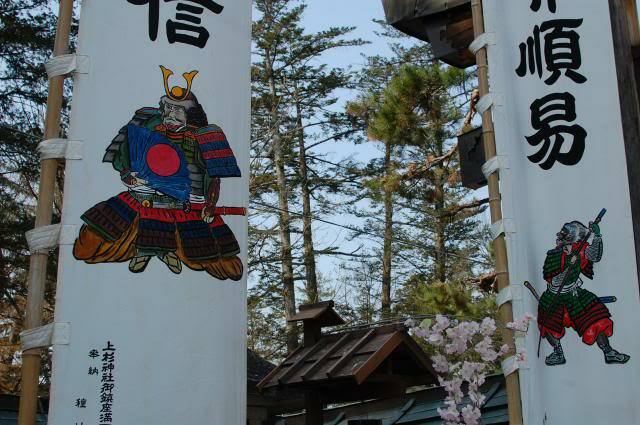 There is also a museum and a mausoleum in Yonezawa containing information, artifacts, and the burials of the Uesugi clan. Following this post is another with more information on Takeda Shingen.